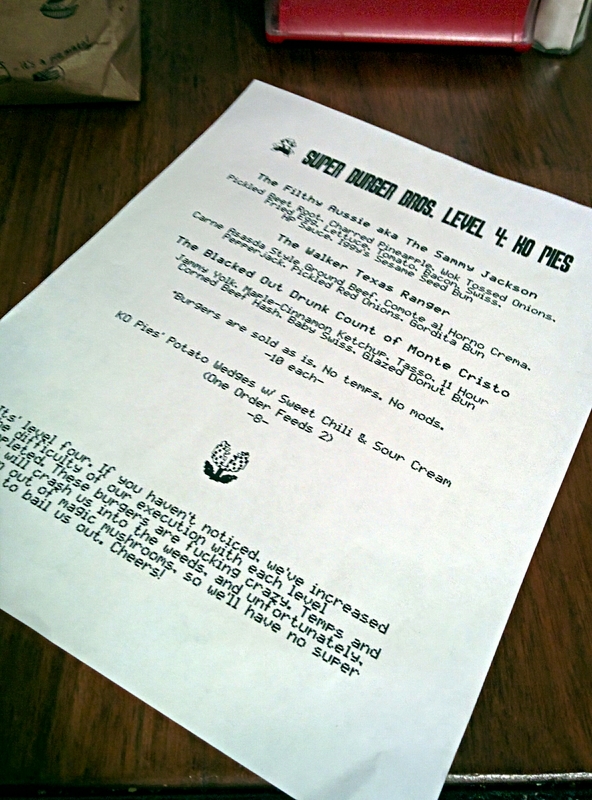 Almost two weeks ago, we went to the Level 4 burger pop up for Super Burger Bros. We had a great time at Super Burger Bros Level 3, so we were really looking forward to seeing what they would be serving up this month. 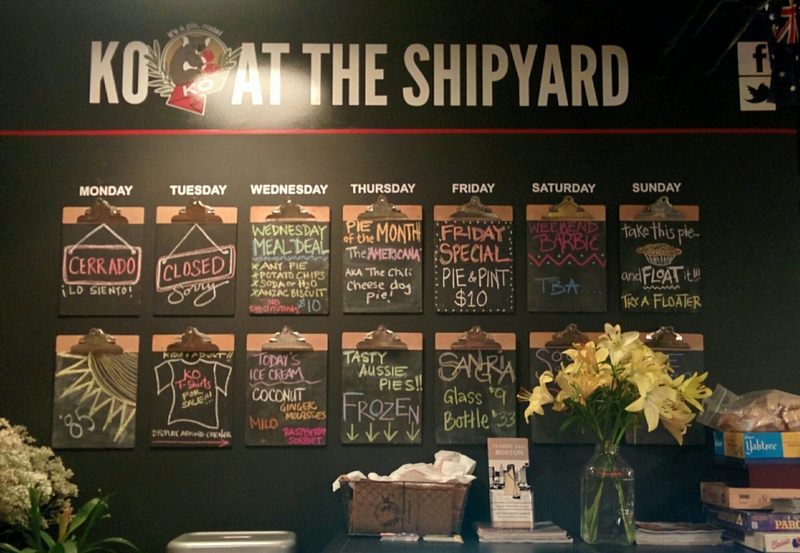 Level 4 was held at KO Pies at the Shipyard with Chef and owner Sammy Jackson on Thursday, July 24, 2014 at 9 PM. The event was free to attend, with no reservations necessary at KO Pies and you could RSVP on Facebook if you so desired. 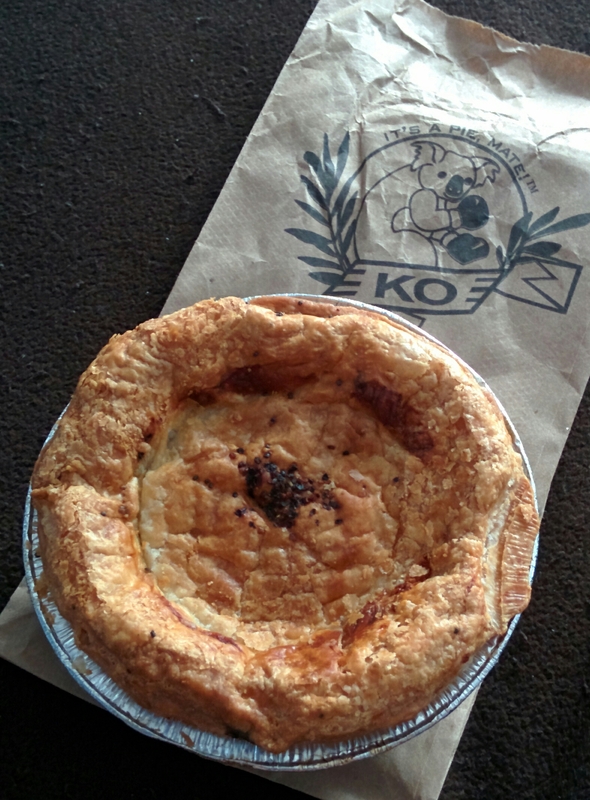 For anyone familiar with the old Scup’s, you know that the location of KO Pies at the Shipyard is an odd one. It is located in the Boston Harbor Shipyard in East Boston’s Jeffries Point neighborhood, nearby Piers Park. You basically drive down Marginal Street, along the waterfront passing Piers Park on the right until you reach a guard booth. At the guard booth, you tell the guard you are going to KO Pies. 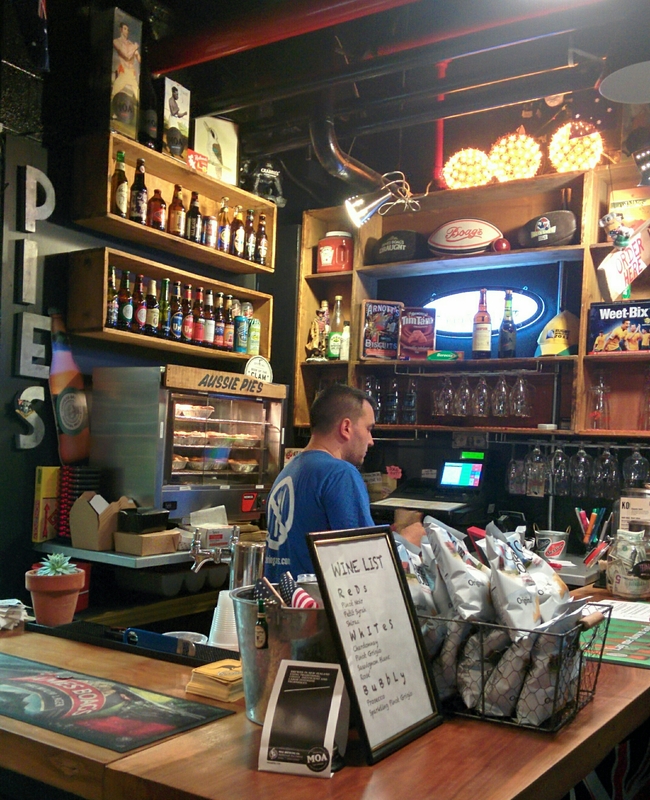 Once they wave you through, KO Pies is located in an old brick building to the left. The space itself is simple, with an ordering area just inside the door after a cute parakeet in a cage at the entrance and a few red tables to the left. More seating can be found outside, with a covered patio that has a fair amount of communal bench seating as well as round tables with stools. There was only two draft beers available for purchase in the patio area when we arrived- Harpoon and Cooper’s pale ale, one of Australia’s top selling beers. Later on in the evening, bottled beer was available for purchase. This burger was my second favorite of the evening. This was a burger with a lot of toppings. It was delicious except for the addition of the grilled pineapple. The pineapple wasn’t very ripe so it couldn’t play off the tartness of the pickled beets. The fried egg and soft onions went well with the juicy beef patty. The toasted Iggy’s bun was excellent as expected. Iggy’s truly makes some great bread. 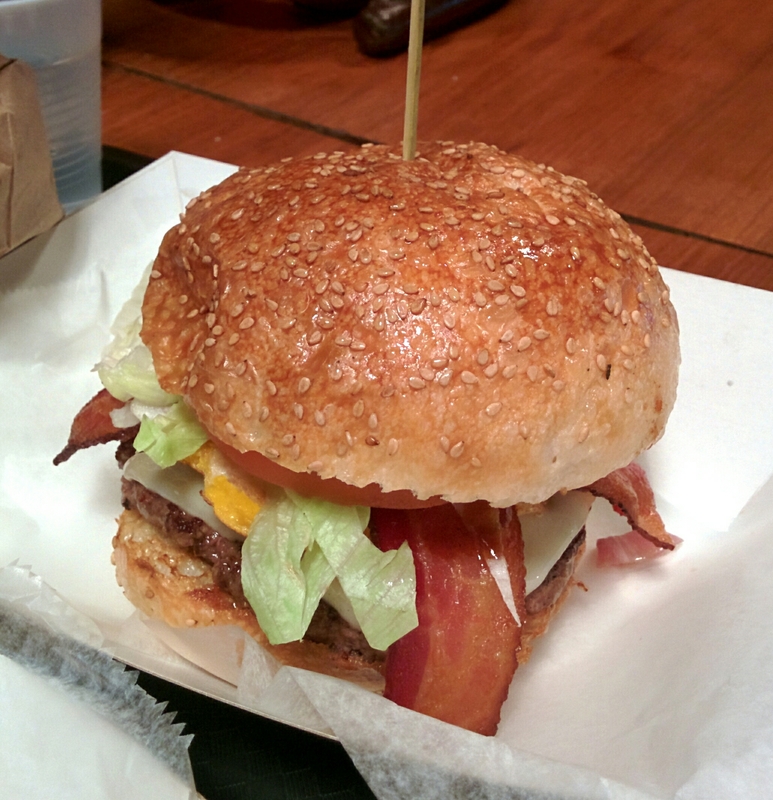 All in all, this burger did not disappoint in terms of flavor. I did however question why this was considered Australian at all, save the pickled beets & HP sauce, which Australians put on everything. This was my favorite of the 3 burgers. The flat cornmeal gordita bun was different in a good way. It was very dense with a slight sweetness from the cornmeal and some crunch on the outside from the griddle. 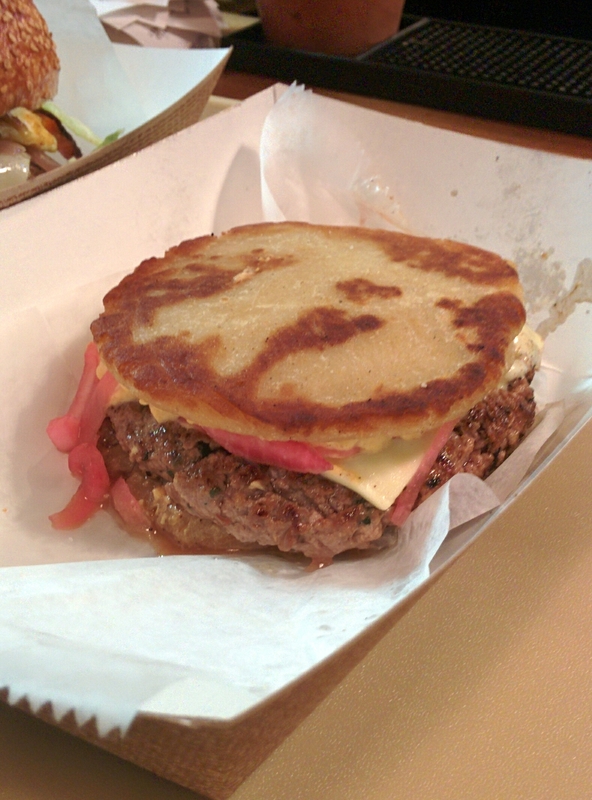 I could see how this whole burger was like a traditional gordita, which is like an arepa, but this take was more like a gordita on steroids because there was at least double the amount of filling. The thick, cool crema gave the pickled red onion something to contrast with besides the bun and burger. I think the red onions could have been pickled in stronger vinegar so they could have been more acidic tasting. Or maybe before serving a fresh squeeze of lime to add brightness. The carne asada burger patty was rich, studded with finely chopped green onion, cilantro, and garlic. The burger patty perfectly cooked to medium. This was the burger that made me go maybe it works, yes it works, no it doesn’t. Sadly, I don’t love donuts. If this burger was on a more traditional type of bun, it would have easily been my first choice in the burger round up. Instead it ended up last. I felt like the donut and the rest of the burger worked great separately but when you put them together, maybe not so much. 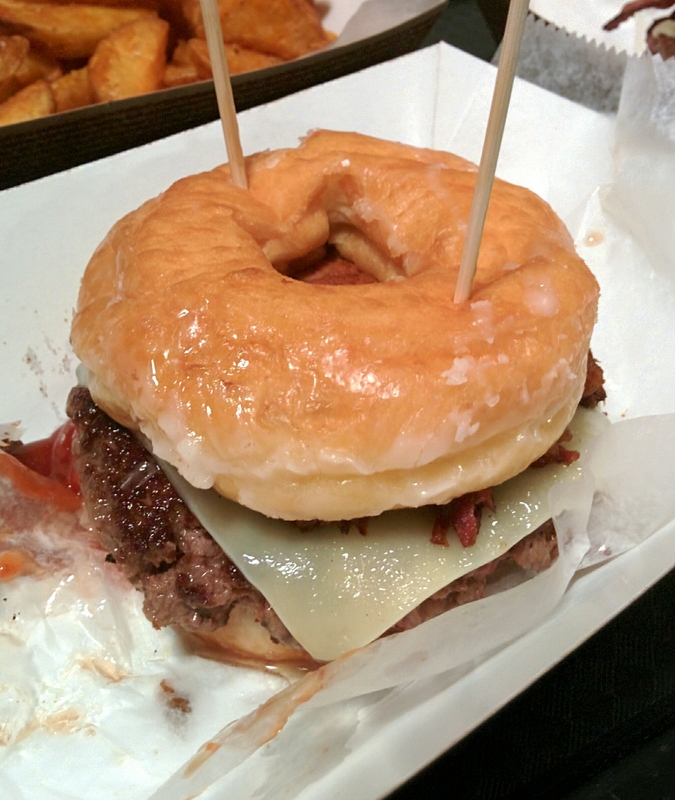 I ended up peeling off the donut and eating the burger paleo-style. You have to be a fan of eating sweet and salty foods together to really enjoy this burger. When I initially picked it up to eat, I had burger juice and sauce dripping down my hand. The corned beef hash and spicy, peppery tasso were drenched in the sweet maple-cinnamon ketchup and burger juice. I really loved all the meat elements in this messy juicy burger. One order was more than enough for 2 people, but we stretched it to accommodate 3 because we were scared of overindulgence. The wedges were fresh from the fryer so they were piping hot and we had to wait for them to cool down. They were crispy with a mealy soft interior, just the way we like them. I actually preferred them plain or just the sweet chili sauce mixed with some ketchup. 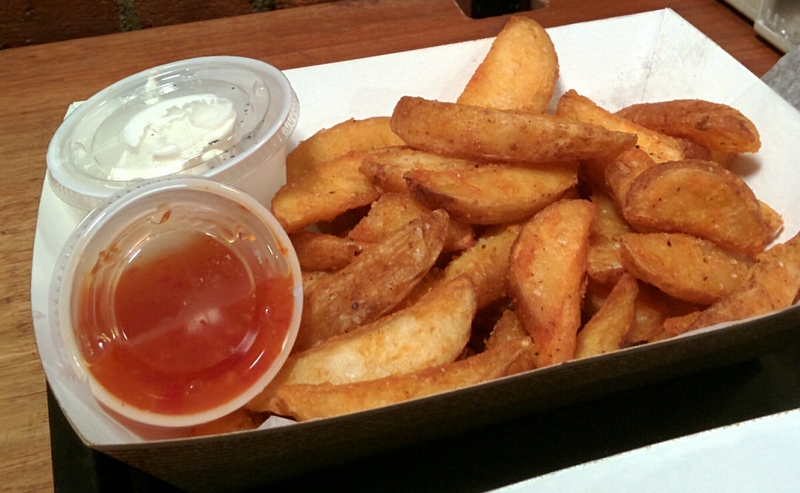 The sour cream was good with the wedges but definitely very rich. We brought home two meat pies, beef stew and lamb, for lunch the next day. 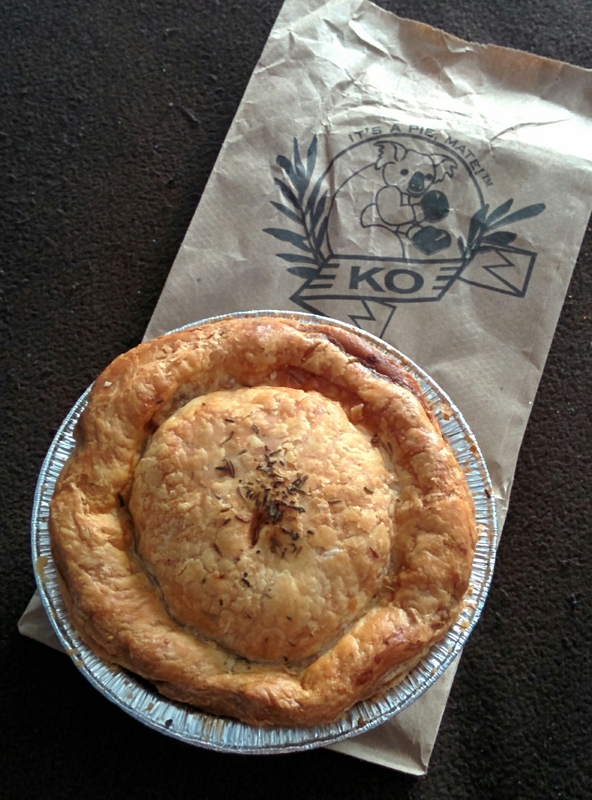 KO Pies at the Shipyard is an offshoot of the original location in South Boston. 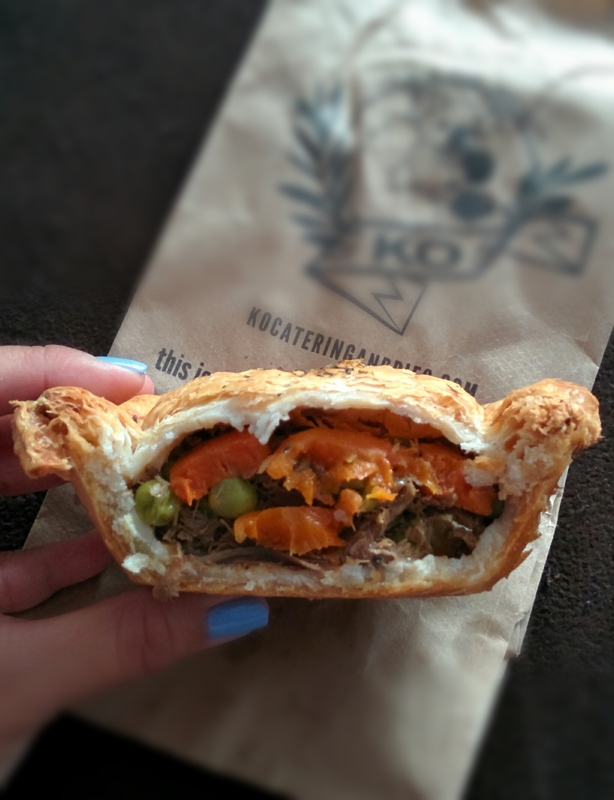 Their focus is on Australian food, primarily meat pies, though their menu does include other items as well. A variety of pies are offered- ground beef, beef and cheese, braised lamb shank, curried vegetable, beef stew, and a rotating selection of pies of the month. Each pie is roughly five inches in diameter, with savory fillings encased in shortcrust base and a puff pastry on top. All of the pies are quite filling, with one usually being more than enough for a meal, especially if you add on a side of garlic mashed potatoes and gravy, roasted fingerling potatoes, potato wedges, chips, green beans, or mushy peas. I made sure to reheat the pies in the oven for about 10 minutes to make sure the crust was crisp and the filling was nice and warm. The beef stew pie is simple and chock full of beef in a savory gravy. That’s it. I’d say the beef stew pie is perfect man food if you pair it with a side of mashed potatoes and more gravy. This pie turned out to be my favorite of the two. The filling was tender braised lamb shank with peas, green beans and carrots. Surprisingly, the lamb shank didn’t have a very gamey flavor. The was a good amount of lamb to vegetable ratio. KO Pies at the Shipyard is a fun and eclectic restaurant that is a unique experience. It’s a hidden gem. You can even take a water taxi from Long Wharf in downtown Boston right to the restaurant. As far as the burgers go… Were these three burgers worth storming the castle for? To be frank, yes for the first 2 burgers and maybe for the last burger. We might just be burger traditionalists at heart who appreciate a few new twists, but we don’t fall into the mix-everything-and-the-kitchen-sink camp, over here. But our opinion is just that, an opinion. We are still looking forward to seeing what these two great chefs cook up for August and hope to see you there. 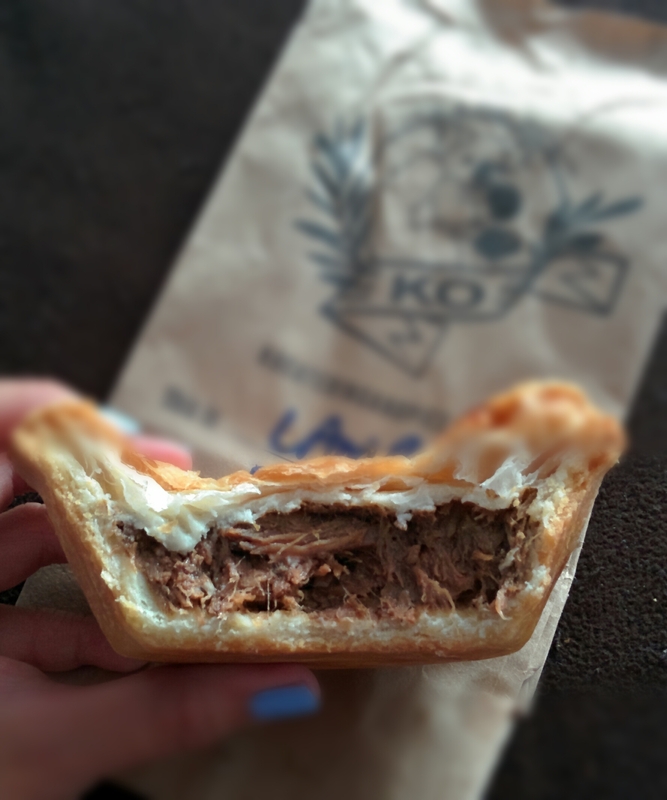 We’ll also be back to try more of the delicious meat pies at either KO Pie locations. Great photos! The burgers looked delish!